The most durable Lifting Hooks currently available! Plustrong Lifting Hooks are designed just for you! Whether you're hitting the gym for powerlifting, weight lifting, CrossFit or just some light routines to get you back in shape, it's imperative that you protect your wrists and palms with premium-grade Lifting Hooks from PLUSTRONG. Our Hook Straps for weight lifting offer a secure fit for anyone looking to enhance their muscle building routines with proper form and better leverage. 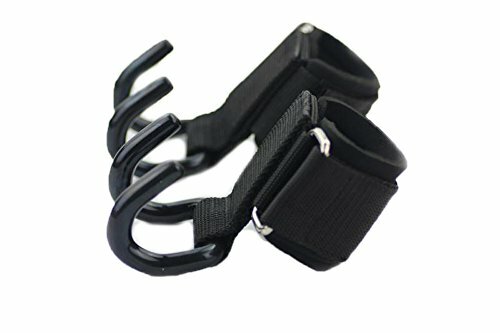 Why Our Lifting Hooks Are Better? PLUSTRONG always wants the best for you, that's why we offer a 100% money back guarantee, or we will help you resolve any problem! br>The heaviest lifts require the strongest of training tools, like Harbinger's new Lifting Hooks. With no drop grip, these extra-wide heavy duty hooks will hold the weight when your hand grip fails. Our premium hook coating increases grab on the bar, while the neoprene cuff cushions wrist. Since not all hands are shaped alike, the Harbinger Lifting Hooks feature an exclusive adjustable hook positioning system based on hand size and fully-adjustable nonrestrictive closure. EXTRA STRONG HOOK DESIGN Unlike other weight lifting hooks, hooks are constructed out of heavy-duty solid steel, so they can be used hard and often without showing signs of wear and tear. They're so strong that they have a 600 pound pull rating! WELL SHAPED COATED HOOKS - These fit perfectly around standard barbells, dumbbells, and machine attachments like lat pulldown bars. The heavy duty rubber coatings eliminate pinched fingers and slipping on the weight keeping them in the same position from the first rep to the last. MAXIMUM COMFORT & SUPPORT Our neoprene wrist wraps are extra wide at 2.5 inches to give you more wrist stability, and they're amply padded for cushioning! FULLY ADJUSTABLE FIT At 13" in length, the wraps on our lifting hooks can be adjusted to fit any man or woman perfectly. Extra strong closure gives you complete security. If you have any questions about this product by Plustrong, contact us by completing and submitting the form below. If you are looking for a specif part number, please include it with your message.